Engineered to hydrate perishables and designed to attract customers, HydraFog™ is ideal for meat, seafood, cheese, deli and specialty display cases. VaporPlus™ is ideal for applications requiring high humidity levels. From warehouses, to coolers, to service cases, VaporPlus™ suits them all. VaporDry™ maintains a high humidity environment, without the dripping and dampness on walls, racking and floors. Our precision machined nozzle technology along with accurately controlled air and water pressures allow for droplet sizes as small as 2 microns and consistently well below a 10 micron size water vapor. Using a 632.8nm HeNe laser diffraction Particle Analyzer that measures drop size based on the diffraction pattern of the laser caused by the water vapor passing through the sampling area, Corrigan optimized the parameters needed to consistently produce dry fog. 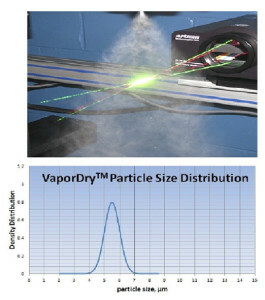 VaporDry™ produces dry fog particles that rapidly evaporate before saturating or condensing on any surface. When you need precise and reliable humidification turn to Corrigan.